Members of the EDA-supported Yelen Queen Bee Multiplication Centre meet to gain and share technical support and build their businesses. Ethiopia is one of the world’s largest honey producers (and Africa’s largest), and in recent years rural farmers have started beekeeping as a way to earn additional income throughout the year. CFTC’s beekeeping project with local partner Emmanuel Development Agenda (EDA) is no exception; it has enjoyed buzzworthy success since it began three years ago. Located in the Amhara Region, the Yelen Queen Bee Multiplication Centre has grown to include 45 men from the surrounding area. 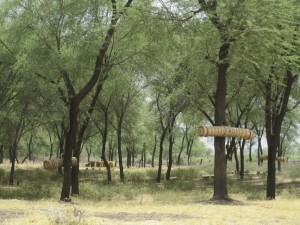 Group members use both modern yellow box hives and traditional hives, which are made of straw and hang in trees. They have produced 30 bee colonies, and have sold 20 for $1,000 birr each, while retaining 10 colonies. The hives produce honey twice a year, usually in June and December, and are an important source of supplementary income for most farmers. 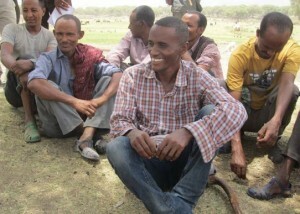 Tagafaw Kabede, a 38-year-old father of two boys, joined the group last September. “I joined the group so that I could produce honey and benefit from the returns. I wanted to raise additional income through diversification,” Tagafaw said. Many members manage multiple hives, and for each kilogram of honey produced, they receive around $225 Ethiopian birr – equivalent to approximately $13 Canadian. “I have four modern beehives, and only one is in production, because three are newly established. At the last harvest I got 30kg from one beehive,” said Beletew Kefelegn. Traditional bee hives, made of thatch and hung in trees. Honey production is taking off across Ethiopia, and the government is supporting this initiative through government extension agents, as well as offering visits by bee specialists from the Ministry of Agriculture. The extension agents and bee specialists provide support and teach skills to the farmers.